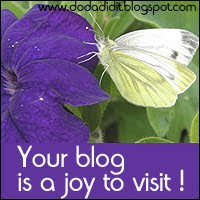 The first indication of what to expect from a wedding is when the invitation drops onto the door mat. Is it a stiff formal invitation indicating the need to dry clean and de-moth the morning suit, or a more relaxed invite suggesting linen trousers and flip-flops? My Aunt rang me in tears of excitement when she recieved the invitation to my sister's wedding a couple of months ago. There was no doubt that this was going to be a Spanish wedding of some sort. 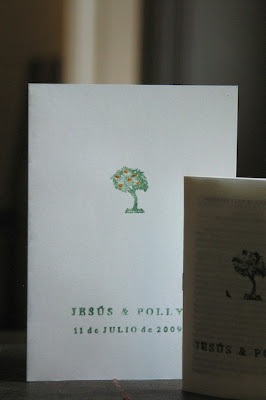 Polly has been living in Seville 9 years so it wasn't surprising that she and her Spanish husband, Jesus, decided to use the Seville orange tree on their invitation and as the basis for their wedding stationery. Wanting an informal look they decided to create their own rubber stamps (based on a painting that my mother had done for them). 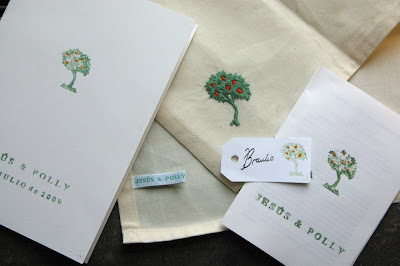 These stamps were then used on invitations, order of service, table setting tags, gift tags (for bridesmaids and pageboys) and then mum spent many an hour embroidering orange trees onto linen to make table napkins to follow the theme through (note the personalised labels on the napkins). What a talented, patient and kind mother you girls have! Those napkins are truly special - a lovely keepsake...things have come a long way since sugared almonds! not to be beaten by the rain!